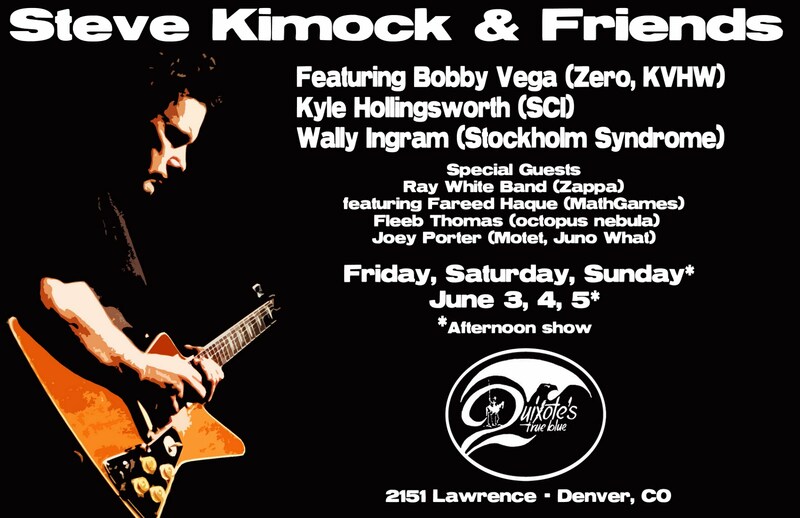 Guitar legend Steve Kimock (Phil Lesh, Ratdog, Other Ones) returns to Quixote's True Blue in Denver, CO for a much anticipated three night run on June 3rd, 4th and an afternoon show on June 5th. He will be joined by Bobby Vega (Zero, KVHW), Kyle Hollingsworth (String Cheese Incident) & Wally Ingram (Stockholm Syndrome) for what will be an incredible musical experience. Also appearing will be Ray White's (Frank Zappa) Psychedelic Wash featuring Fareed Haque (formerly of Garaj Mahal, MathGames) Fleeb Thomas (Octopus Nebula) and Joey Porter (Motet, Juno What). With the presence of such incredible talent and musicianship, the energy at Quixote's is sure to be through the roof. The Friday and Saturday shows are slated to start at 8pm and the Sunday show at 2pm. Tickets will be available at the door for $20. Join us for three days of fantastic music! Can't Wait! I'll be at all three! Blissssss! Last night would have been amazing if all you little cheese heads would learn to shut your mouths and listen to the music. 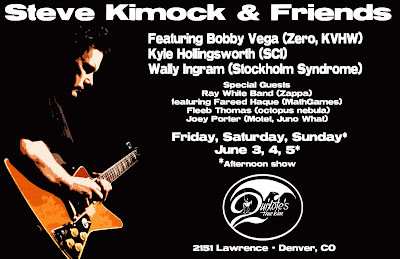 This is Kimock, not SCI. Talk between songs if you have to, or leave. I hope the tapes came out okay. You all sound like pack of barking dogs, its embarrassing. Go see STS9 or some other background music for your party. I know you're used to going to shows where the music doesn't really matter, you're just there to party. This is the real deal, every single note matters. Act right.